Springs are crucial to the operation of your garage door. They are there to lift and lower your door by balancing the weight of the panels. When they’re in good condition, your door should glide up and down smoothly and without hiccups. When they’re not, they could stick or snap – with serious consequences. 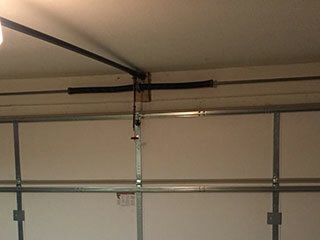 Most garage doors make use of either a torsion spring system or a pair of extension springs. To identify the system your door uses, look above your door for a shaft – this is the most common location for a torsion spring. If your springs run along the sides of your door, they're likely to be extension springs. Both systems are designed to pull your door off the ground and lower it as required, without dropping too quickly. Because they're used with every opening and closing of the door, they are prone to wear and tear – and once broken, you'll be left with a door that's become unusable. Our technicians have years of experience working with both models, so if yours have broken, we'll be able to provide replacements in no time. Springs function by harnessing power and releasing pressure. The correct tension makes all this possible. If your door is not used very often, its springs can become wound too tight, and if it opens and closes multiple times a day, the opposite may happen – the components may wear out and lose tension. A regular maintenance plan will help to ensure they're kept at the right balance. If these springs are neglected for too long, they can fail completely – leading to a door you won't be able to move. Springs are strong and stable for the most part. But when they're old and worn, they can snap – when they do, they'll release pressure suddenly in unpredictable directions. Don't attempt to handle these parts yourself - call on our experts instead. Our experts at Garage Door Repair Newberg will fix your door and give you a regular maintenance plan to help you lubricate and adjust your springs as needed – we have the training to ensure no one will get hurt!